Larceny is a wheated bourbon made by Heaven Hill distillery. The story goes that John F. Fitzgerald, a treasury agent trusted with the keys to the rickhouse, would sneak in at night and drink from the best of the bourbon barrels; some call him a thief, others call him a very intelligent individual...I wanted to share that story because it's of the best or the worst marketing stories for a whiskey that I've ever heard – I can’t quite tell (probably the worst). Nose: Detecting a lot of fresh baked wheat bread at the top of the nose. There is some cinnamon swirling around here and this combination is reminiscent of cinnamon toast crunch cereal. Sweet aromas quickly follow- brown sugar, vanilla, some fudge. It's also fairly nutty. Taste: Sweet spice is the first thing noticed on the palate. Much more on cinnamon than the nose revealed. The wheat bread and nuttiness combine with honey for a unique but well balanced profile. Finish: Medium in length with sweetness, baking spices, and slight oak. Conclusion: Trying new wheated bourbons is always on my to do list. Larceny is a solid whiskey with a flirtatious price tag around $25. It's very drinkable at 92 proof, and if you like sweet and spicy bourbons, definitely give this a try. Old Forester is a brand dating back to the late 1800s with founder George Garvin Brown. Currently produced by Brown-Forman in Louisville, KY., this limited edition bourbon is released annually on GGB's birthday (September 2) to commemorate the brands history and his legacy. I usually hold on to limited releases for special occasions, and as I recently celebrated my 26th birthday, I figured Old Forester Birthday Bourbon was the best bottle to celebrate with. Nose: This is honestly one of my favorite noses. The oak is heavy but in a gentle, non abrasive type of way. Creamy vanilla icing, maple, and cinnamon float out of the glass with subtle hints of banana oil and cooking sugars. Taste: A very chewy mouth feel for the proof. Oak centric upfront with sweeter notes appearing on the mid palate. Rich flavors of juicy fruit, yellow cake, maple, vanilla, and cinnamon combine for an experience that way exceeds my expectations. Finish: Medium in length. Very warming with spice, yeast, and dry oak. Conclusion: From start to finish, this is an awesome bourbon! The nose is fantastic, and while the taste doesn’t quite match that brilliance, it is still exceptional. If you like oak forward bourbons, this will be right up your alley. 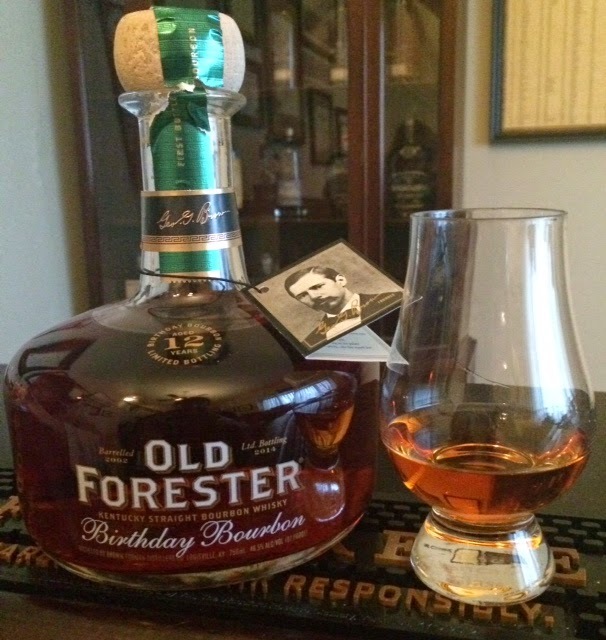 Keep an eye our for future releases of Old Forester Birthday bourbon, hitting stores mid/late Fall.